Verhaeren was a Belgium poet, who despite his future legacy studied and practiced law for a short time. His exposure to some of the most radical and talented writers and artists soon meant that he changed his chosen career path to professional poet. 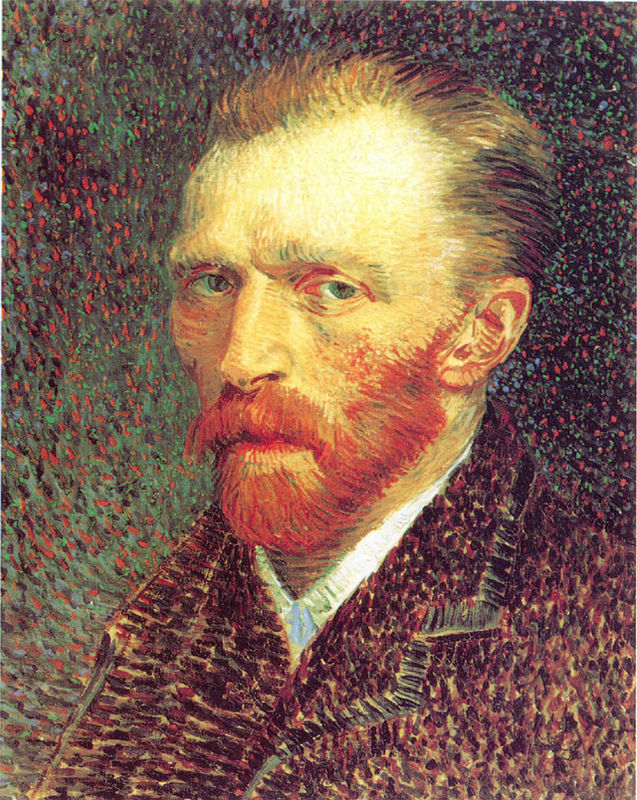 The Belgian is considered the mouthpiece for Impressionism at the turn of the 19th century. Georges Seurat painted La Chahut in 1890, during a period when his artistic career was almost entirely dedicated to performances of circus and cabaret acts from Paris. The artist completed La Chahut a year before his death and the painting caused controversy due to its social statement of Parisian nightlife. La Chahut is most likely from a chahut café-concert, for which Seurat's friends and poets Jean Ajalbert and Emile Verhaeren often frequented. 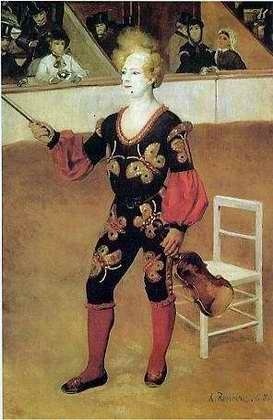 Seurat and many other Impressionists had already grown fond of the circus and had begun to depict performers on a mass scale. This image is of a cadre of performers performing the cancan on stage in front of a bass violinist and an orchestral band. The overriding theme in La Chahut is that of the performance and its onlooker, and the dynamic that can be deduced from this. Similar to Grande Jatte, La Chahut was criticized as being too wooden and mechanical upon its exhibition and such a representation was seen as detrimental to the performers of such shows. In addition to this the presence of one leering man as solely representative of the audience, highlighted the show as titillation as opposed to any higher form of entertainment. The Divan Japonais is a poster for Parisian nightlife of the era and is widely regarded as a preliminary study for Seurat's later work on La Chahut. 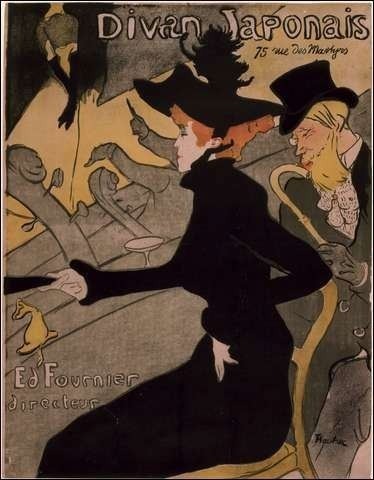 Posters for various cafés and live acts were a common sight in Paris and Lautrec's poster, as its title denotes, incorporates Japanese elements into the scene. 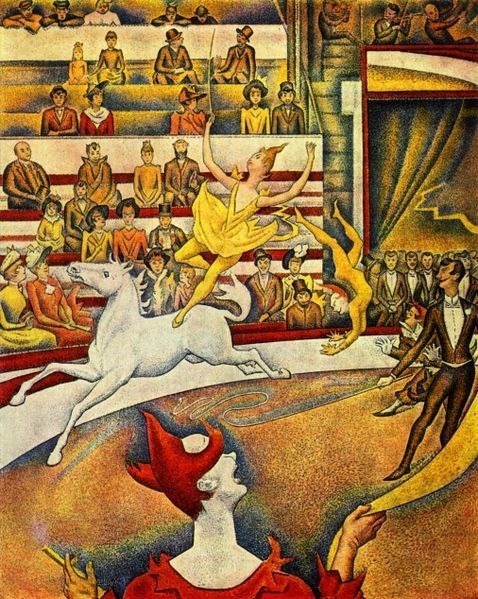 The orchestra seen at the front of the poster bears marked similarities to the orchestra in Seurat's own work. Other posters, such as those by Jules Chéret found an avid fan in Seurat and the artist eagerly collected such memorabilia. As an artist in Paris at the time Seurat's social life would have been engulfed by the menagerie of live performances and shows as entertainment grew in demand. Live performers would be a constant pull for artists and writers looking for inspiration. Seurat's use of composition is perhaps the biggest indicator of his views of Parisian nightlife. 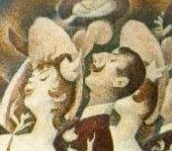 The figures to the right of the piece performing the cancan are perhaps the most eye catching and their synchronized form almost make them appear as one entity. Their legs are the same length, both on the ground and in the air. The part of painting that critics comment on, however, is the figure below the performers who stares upwards at the open skirt of the woman. While the performer is a picturesque beauty the onlooker is ugly in form and suggests a certain detestability to proceedings. Seurat's work depicts this theme more so by the performers faces who seem almost cartoonish. The female performers curved smile and closed eyes are a direct match of the male performer's moustache. Their performance and their look is synchronized to every detail. The two key rules of chromoluminarism for Seurat were how color and brush stroke could evoke certain emotions and how the close proximity of different primary colors could be used to create a third. Gaiety = luminous hues and upward lines. Calm = balance of light and dark colors and horizontal lines. Sadness = dark and cold colors and downward lines. The main color theme in Seurat's work is orange and brown. Such an effect is created by his use of lighting and how it reacts in juxtaposition with other darker colors. Apart from the cello player at the front of the piece, all the painting's figures appear to be wearing the same color and this effect is maintained by the encompassing low lighting. The bass violinist's black suit looks blue in its brightness and ensures the brightness of the work. The resulting effect is a piece which seems void of any truly darkened portions. 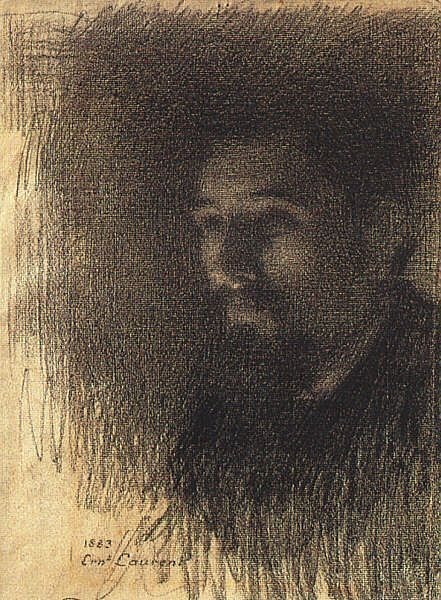 Seurat's brush strokes or the lines he creates with such strokes, support his theories of emotions evoked in paintings than his use of color do. His female performer's skirt creates perhaps the biggest and most eye catching upward line of the painting and its curvature is echoed in everything from her smile to her fellow male performer's moustache. Seurat's brush stroke creates a paradox with is subdued hues and this may link to his layered criticism of the scene. The majority of contemporary reception leveled against Seurat's La Chahut during his life was in regard the painting's mechanical nature and the manner in which the one identifiable audience member appears to be leering at the performance. Seurat's scientific, methodical approach can be seen in his dots in this piece and even Vincent van Gogh who visited Seurat in 1888 agreed with many of the views that for such an action-packed show Seurat's work was oddly static in its presentation. 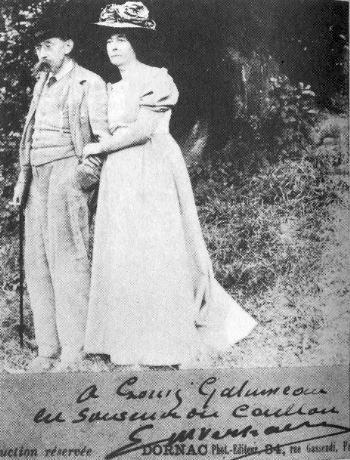 Seurat's praise for La Chahut stemmed from the literary Symbolist circles that him and close friend Paul Signac frequented at the time. Here critics understood the nature of Seurat's work and praised it for its bold commentary on the Parisian bourgeoisie of the time. 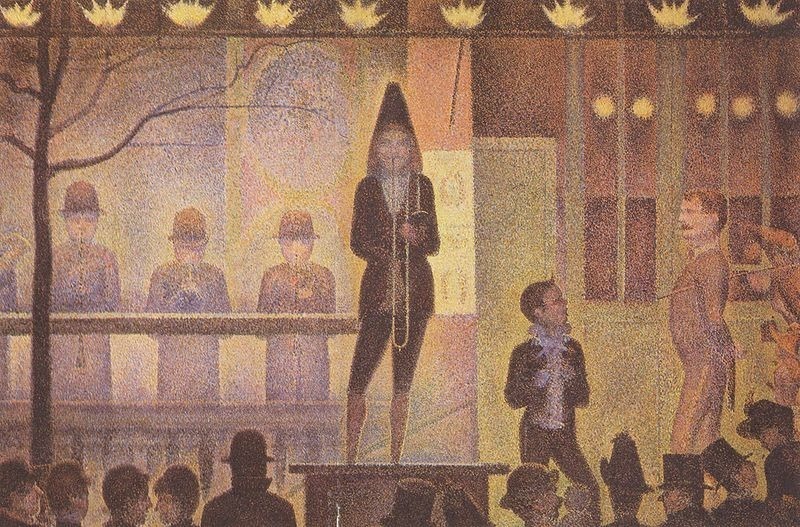 Gustave Kahn was one of many to note that Seurat's depiction of the "beautiful" performer and the "ugly" onlooker was a depiction of the "contemporary disgrace" of such performances. Novelist Hajo Duchting notes that Seurat's work isn't merely something to be read on an aesthetic level and has many different layers of interpretation. 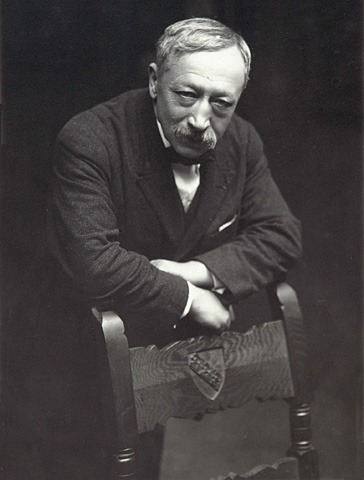 The writer notes that outright criticism of society is avoided and instead Seurat's work is described as "scientific rigor, a subjective and ironic view and a hint of symbolism". Such a view is echoed by author Karl D. Buchberg who notes that Seurat's is "a scene of popular urban entertainment with a suggestion of lewd voyeurism". Seurat was 26 years of age when he completed his work on La Chahut and the work is testament to his increasing love of the variety of entertainment in Paris at the time. The artist was increasingly moving in circles in which circus and cabaret acts were a normal and common method of passing the time for artists and writers. Here many artists, including Georges Seurat would find the inspiration for works such as La Chahut. Also, Seurat was increasingly known as an artist whose paintings carried as much weight in their social commentary as they did aesthetically. Georges Seurat completed La Chahut during an artistic period in which Impressionism had received a new breath of life from Neo-Impressionism and some of the works that Seurat himself had painted. Around the time of the completion of Grande Jatte Impressionism needed an infusion of new talent and techniques and Seurat's pointillist approach served this endeavor perfectly. La Chahut continued this tradition and despite its size not being on the same immense scale as Grande Jatte, its stylistic similarities are clear. Seurat painted the work at a time when the city of Paris had become flooded with a variety of nightly entertainment and its impact on artists and poets of the period is also obvious. For further insight into the life and works of Georges Seurat, please refer to the following recommended sources.